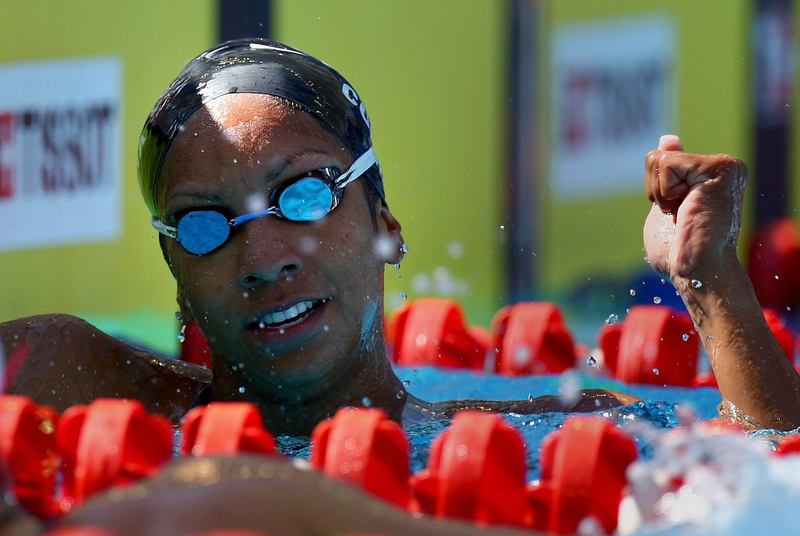 McClendon ’s pregame routine was simple, but it helped her become the first black woman to earn a spot on the U.S. Olympic swimming team, break three American records and earn a silver medal in the 400 freestyle relay in the 2004 Summer Games in Athens, Greece. “I remember the experience of walking underneath the tunnel out into the pool complex,” McClendon said. “Just seeing the fans, the photographers and the water looking completely still. It was exciting.” While McClendon achieved greatness, she had to face disappointment and scrutiny from her father throughout her journey. Maritza Correia of the United States of America smiles with her team after they received their gold medals in the 4x100m Freetstyle at the 2007 XV Pan American Games at the Maracana Stadium on July 19, 2007 in Rio de Janeiro, Brazil. Born to Guyanese parents in San Juan, Puerto Rico, McClendon was the youngest of three kids. Her mom, a former tennis player at the University of London, was a nurse and her dad was a mechanical engineer. While she was raised in a competitive household, McClendon started swimming because, at the age of 6 years old, she was thrown a curve. “My mom and I would [walk] to the beach very often, and she noticed that I kind of started walking with a tilt. So she decided to take me to the doctor, and sure enough — scoliosis.” McClendon’s back was 25 degrees off-center and she was very close to needing back surgery. But her doctor recommended swimming or gymnastics as a form of therapy. “The first lesson I had was just a summer program at someone’s backyard pool,” she said. “The teacher was teaching me to get from one end to the other without drowning.” By the end of that summer, though, she was hooked, and signed up for year-round swimming in Puerto Rico. “I enjoyed swimming from the get-go,” she said in 2013. “But I wasn’t the best one in the water right away. I had to work to swim fast. I loved to compete and win medals and trophies … I always had a drive to get as many as I could.” McClendon’s family relocated from San Juan to Bradenton, Florida, when she was 9 years old, and in 1990, they moved to Tampa, Florida. McClendon became a member of the Blue Wave Swim Club, and swam up through the USA Swimming ranks. By 1996, McClendon was watching Olympic swimmer Amy Van Dyken win four gold medals. “I felt like I was living it through her,” she said from her home in Tampa. While McClendon started to flourish, competing at the high school level in Florida, scrutiny from her father was intense. “He kind of came down at me,” she said. “And questioned why I didn’t swim well [at state championships]. I was very upset.” But with encouragement from her mother and teammates, McClendon came back to win six state championships. Maritza Correia of the United States of America celebrates her team winning the gold medal in the 4×100 Medley Relay during the 2007 XV Pan American Games at the Aquatic Park on July 22, 2007 in Rio de Janeiro, Brazil. After finishing third at the 2004 Olympic trials in Long Beach, California, in the 400 relay, she made the U.S. Olympic team. “Earning a spot on the Olympic team is special for everyone,” she said in 2013. “But it was an even better feeling to know I made history … I wanted to be a role model to minorities.” And that she is: the first Puerto Rican of African descent to be on the USA Olympic swimming team. McClendon’s career was cut short due to a double-shoulder injury in 2008. She retired from the sport soon afterward. Now, as a wife and mother of two children, McClendon has another goal. While she’s transitioned from being an Olympic swimmer to working at Nike to now working in marketing at OshKosh, McClendon wants to encourage water safety in the black community. “You hear 10 people drown in the U.S. every day, and 70 percent of black children don’t know how to swim.” That’s why McClendon’s now serving as a spokeswoman for Swim 1922, hoping to introduce African-Americans to the sport and teaching them basic water skills. Vance Brinkley is a young writer based in Washington, DC. He loves playing lacrosse, watching indie films, and listening to music from Project Pat to Toro Y Moi.